Tap-to-pay terminals make it easy for you to pay for things with your smartphone (hey, Apple Pay! ), so in theory, you can use them to pay with anything that can support an NFC chip. 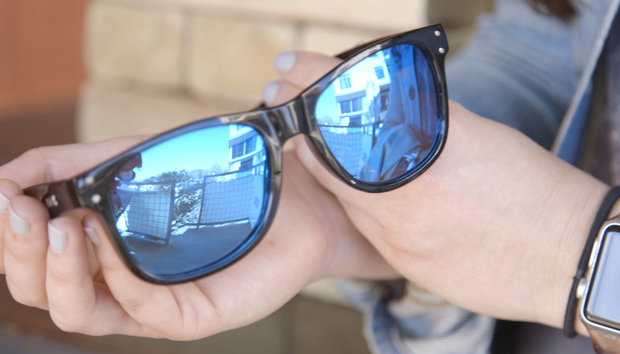 That’s what Visa was illustrating at South by Southwest through their latest payment-enabled accessory prototype: a pair of sunglasses. The sunglasses had a small NFC chip embedded on the side, which was linked to a pre-paid card, and you could use the glasses to pay for stuff wherever tap-to-pay was accepted. When demoing the glasses, it worked seamlessly—even quicker than Apple Pay, since I didn’t need to wait for the terminal to accept my fingerprint scan. The glasses are just a prototype, and part of an ongoing push from Visa to show just how easy this technology can be to implement. The sunglasses will be used by athletes during the World Surf League in Australia this March, and last summer, Visa issued payment-enabled rings to athletes competing in the Olympic games. Using athletes to show off these accessories makes perfect sense—you’re not going to have space on your uniform for a pocket to stash some cash or your iPhone. Plus, they’re waterproof. I’m already imagining myself at a luxury resort, using my sunglasses to buy a mojito from the pool’s swim-up bar, so I hope Visa considers bringing these to the masses soon.